Trieste incineration plant: ramp to the discharge hopper. The Lega of Italian vice-premier Matteo Salvini declares that waste produced in Campania must no longer be disposed in Northern Italy. We are fine with that, each community should take care of its own waste and become self-sufficient in waste disposal. European Community law itself prescribes that. But then gain, why when it comes to Trieste, where self-sufficiency in waste disposal has been since long achieved, the local incineration plant continues to intake the waste of all others? 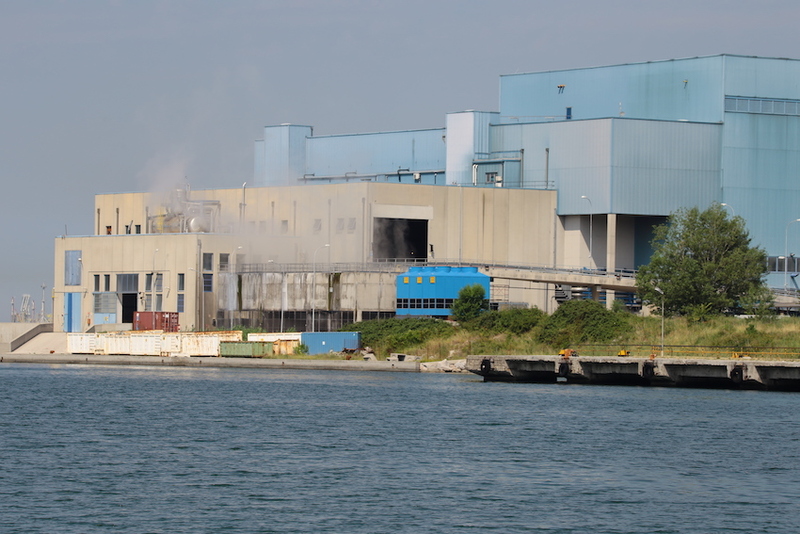 Being it Campania, Lombardy, or even Veneto, all waste takes the way to Trieste, where it is burnt in the waste-to-energy incinerator. Only, the waste produced by doing so, which the people of Trieste would be happy to avoid, is much more than the energy recovered. Even, this recovery is not even visible in the super inflated bills of energy providers. Who happen to be also in charge of the alleged “waste-to-energy plant”. All that remains to the people of Trieste is the increasing cost of disposal and large energy bills. However, there certainly is someone who makes a profit from it. Starting from the Italian regions that are less virtuous when it comes to waste disposal, as to them Trieste is a “safe harbor” to dispose their inconvenient waste. Possibly, even the waste nobody else wants. And this is how the Free Territory of Trieste, with its “unique” international Free Port, became the “promised land” to dispose the waste of Campania, where the Movimento 5 Stelle (the Five Star Movement), but also the waste from the “Pro-League” regions of Northern Italy: Lombardy, Veneto, and Friuli are loyal “customers” of the Trieste incineration plant. And what is the Municipality of Trieste, (rear)driven by the Lega itself, doing about it? It lets such huge operations take place, contaminating an independent State. Maybe that is the real thing: the Free Territory of Trieste does not belong to Italy, it is only sub-entrusted to the temporary civil administration of the Italian Government. And people in Salvini’s party are well ware of it, because they signed an agreement to defend the international Free Port from the aggressions of speculators (as is the so-called “sdemanializzazione” or removal from State property). They tried to ride the wave of the Free Territory of Trieste. They cannot stop now. Not even if, in order to work, they need to follow their ultranationalist political allies. When it comes to “foreign” waste, in Trieste not a single politician makes a sound, not even the Assessor to the Environment, who is in no other party than the Lega. The people of Trieste shall never know that, for example, waste comes from land and sea to be disposed in their city, and that it comes also from other “regional” ports like Monfalcone and Porto Nogaro: we are also the landfill of Friuli. But unfortunately there is more. Reading through data of 2015 (the latest available, data 2016-17 is yet to be published, but still current since things did not change, at least, not for the better), Veneto alone sends over 100,000 tons. of waste, and Campania (Napoli, Caserta, Salerno) over 40,000 tons. of waste. And then of course there are also Lazio, Tuscany, and Lombardy. Among the companies that had Trieste as their final destination, there is also the E. Giovi Srl. recently seized (July 2018) for illegal waste management. The E. Giovi was in charge of the huge landfill of Malagrotta (Lazio) which has sent, and is sending, some of the most hazardous waste produced in Rome to Trieste. What we are talking about it paradoxical: our independent State, the Free Territory of Trieste, is undefended before the Italian mafias because it is undersold to them by its own local political establishment. One example for all is the double face of the Five Star Movement, which in Southern Italy fights against the dangerous incineration plants, while in Trieste it lets dispose and burn all the “garbage” its members from the South don’t want in their own garden: (LINK). They call it the politics of compromises. But it is a politics with one recurring victim, which is always Trieste, with its little territory that is already very much polluted after serving for long decades as the “relief valve” of the system that disposes waste illegally, which in Italy is under the control of the ecomafias.